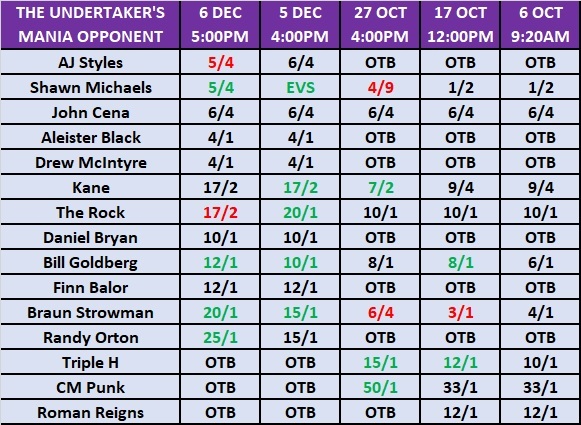 Earlier today, I published a post about the Kambi oddsmakers' WrestleMania 35 markets where clients can wager on who certain wrestlers' opponents will be at April's show. In the post, I noted that the markets had been taken down and that I'd publish an update once I see them again. Well, they've now been republished. 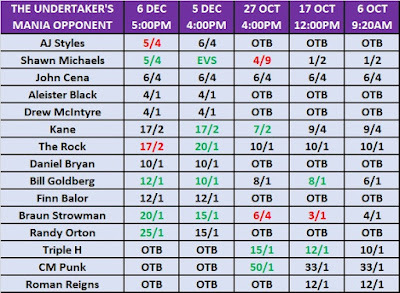 The only market that has been adjusted since the post is the one where clients can punt on The Undertaker's opposition. In the aforementioned post, I wrote about being glad to see Shawn Michaels drifting out as I felt he was an incorrect favourite to begin with. He has now been replaced at the top by AJ Styles, who has been lowered from 6/4 into 5/4. Michaels is now at 5/4 from EVS. Another selection that has been cut is The Rock. He went from 20/1 into 17/2. I also noticed a small error in one of my notes for another market. I had Bobby Lashley at 10/1 to be Brock Lesnar's opponent. However, the price had been increased from 10s into 12/1 when the market went back up yesterday. New markets, where clients can wager on what they believe will be the major title matches on the Mania card, are now available. In the Raw Women's Championship market the favourite is one that is reportedly the current plan - Ronda Rousey .vs. Becky Lynch. This selection is 1/2. If you've been following along, you'll be aware that I have been going against the reports and believe that - if it's the main event - Charlotte Flair should be in the match with Becky Lynch and Ronda Rousey. A Charlotte Flair match is favoured to be the WWE Smackdown Women's Championship fixture on the Mania card. Asuka .vs. Flair is 3/5. This is followed by Asuka .vs. Becky Lynch (7/4), Lynch .vs. Flair (5/2), a match I thought would headline Mania this time last year, but obviously not now - Asuka .vs. Ronda Rousey (5/1), Lynch .vs. Flair .vs. Rousey (13/2) and Asuka .vs. Naomi (10/1). The WWE Universal Championship market has Brock Lesnar .vs. Braun Strowman and Brock Lesnar .vs. Seth Rollins as joint-favourites with odds of 6/4. The Wrestling Observer Newsletter reported a few weeks back that Lesnar .vs. Rollins is one of the matches planned for Mania. All we can work with is the idea that this COULD be the Universal Championship if Strowman doesn't win the strap from Lesnar at the Royal Rumble. Going by what I've been watching on TV, I get the feeling Strowman will square off against Drew McIntyre at Mania. However, getting there might have to involve McIntyre costing Strowman the chance of becoming champion either at Tables, Ladders and Chairs or at the Royal Rumble. Should Strowman .vs. McIntyre be for the Universal Championship, the bookies will pay out at 5/2. AJ Styles .vs. John Cena is an even money favourite to be the WWE Championship match. The second-fave is one that I strongly doubt we'll see at Mania - Styles .vs. Daniel Bryan (2/1). However, it's in joint-second with a match that I could absolutely see happening - Bryan .vs. Cena. A match I once thought had a chance of happening at WrestleMania 35, but looks highly unlikely now that both are heels and holding different Smackdown titles is Daniel Bryan .vs. Shinsuke Nakamura. It's 15/1. I would like to see the match, but it's so far away from happening at this point that the odds are in line with my reassessed expectation.